X-ray computed tomography (XCT) for 3D visualization of internal structures. XCT is a non-destructive characterization technique used to image a sample without having to physically slice or otherwise destroy it. The technique is based on generating computer-reconstructed 3D images from a collection of cross-sectional X-ray radiographs taken at multiple orientations throughout the sample, and measuring the resultant decrease in intensity. X-ray attenuation is caused by scattering or absorbance of X-rays passing through sample. The degree of attenuation is primarily a function of X-ray energy and the density and atomic number (Z number) of the material being imaged; higher Z number and density of the material cause a more rapid decrease in intensity. Some of the main applications of X-ray computed tomography include non-destructive volumetric 3D imaging of PGM-free electrode structures for a better understanding of particle size and distribution, as well as 3D projections of fluid flow fields to visualize porosity, microporosity, fractures, and roughness. 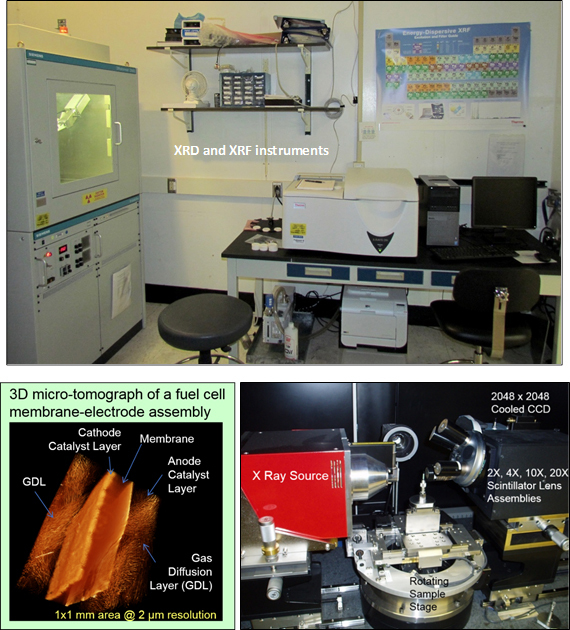 Capability Bounds: X-ray techniques are used for characterization of PGM-free powders and electrodes, mostly targeted for information at the nanometer and micrometer scale (i.e., crystallite size, particle size, morphology). Unique Aspects: X-ray characterization techniques have been excellent tools for understanding and optimizing PGM-free electrodes, which typically are one order of magnitude thicker than Pt/C electrodes. In particular, micro-XCT has been a key technique for enhancing fuel cell performance via the optimization of the catalyst-to-ionomer ratio and for ensuring improvements to the ionomer distribution within the cathode. Performance enhancements have been in both the kinetic (enhanced proton diffusion) and mass transport (water management) regions. Availability: All X-ray characterization techniques are part of the LANL fuel cell program and are available to ElectroCat. Q. Li, D. Spernjak, P. Zelenay, and Y.S. Kim, “Micro-crack formation in direct methanol fuel cell electrodes,” J. Power Sources, 271, 561 (2014). G. Hwang, H. Kim, R. Lujan, R. Mukundan, D. Spernjak, and R. Borup, “Phase-Change-Related Degradation of Catalyst Layers in Proton-Exchange-Membrane Fuel Cells,” Electrochim. Acta, 95, 29 (2013). D. Spernjak, J. Fairweather, R. Mukundan, T. Rockward, and R. Borup, “Influence of the microporous layer on carbon corrosion in the catalyst layer of a polymer electrolyte membrane fuel cell,” J. Power Sources, 214, 386 (2012). Benefit: X-ray techniques are essential for the development of novel PGM-free materials, as they provide an understanding of the changes in carbon nanostructures, phase compositions, and pore structures resulting from catalyst synthesis modifications. Furthermore, these techniques are crucial for the evaluation of changes in the electrode structure, catalyst-ionomer distribution, membrane, and transition metal content in catalyst layers.